Your body can make the amino acid L-glutamine, often simply called glutamine, and you also get it from many of the protein-rich foods in your diet. Healthy people don't typically need glutamine supplements, but some people take them in hope of improving their weight-loss results. The evidence for this is still preliminary and conflicting, however. These supplements may not be safe for everyone, so check with your doctor before adding them to your daily regimen. If you get your glutamine by eating more high-protein foods, there may be some weight-loss benefits. 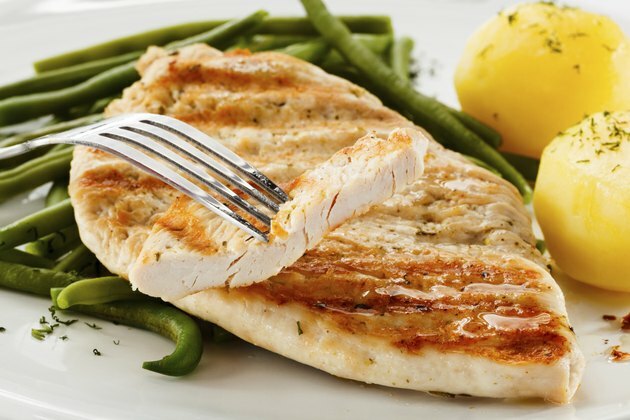 Following a low-calorie diet that is high in protein and low in fat may help you feel fuller and lose more weight than a standard-protein diet that is low in fat with the same number of calories, according to a study published in the "American Journal of Clinical Nutrition" in December 2012. This type of diet may also help minimize the loss of muscle and decreases in metabolism during weight loss. A small preliminary study published in the "European Journal of Clinical Nutrition" in November 2014 found that obese women who took glutamine supplements for four weeks lost weight even without changing their diet and exercise habits. When they took a protein supplement for the same amount of time, they didn't experience any significant weight loss. But larger studies are needed to verify these benefits and determine what, if any, dose of glutamine is most beneficial for weight loss. Although protein in general may help limit the loss of muscle during weight loss, this doesn't appear to be the case with glutamine. Athletes who took glutamine supplements while on a weight-loss diet didn't maintain any more muscle than those given a placebo in a study published in the "Journal of Sports Science and Medicine" in 2003. Glutamine supplements may not be safe if you have liver disease, kidney disease or Reye syndrome or if you are pregnant or nursing. L-glutamine supplements may also interfere with certain medications, including those used for chemotherapy, HIV and seizure prevention.